Ever since we built our house I’ve regretted not getting hard woods in our family room. I’m not even sure why we didn’t get them to begin with. Carpets get so nasty with all the build up, especially with dogs. Even when my carpet cleaner was being used every week, the carpet would start getting grimy looking. We finally took the plunge and replaced the carpet with wood floors. We chose bamboo flooring because we heard it’s really strong and that’s good for people with dogs. We decided we wanted to do this about 3 months ago, but I had trouble deciding what to get. We got the flooring at Floor and Decor after going from place to place, looking at options, colors, pricing, etc. The floor guy came in and did the whole thing in one day. They did such a great job. I’m so excited about how they look! 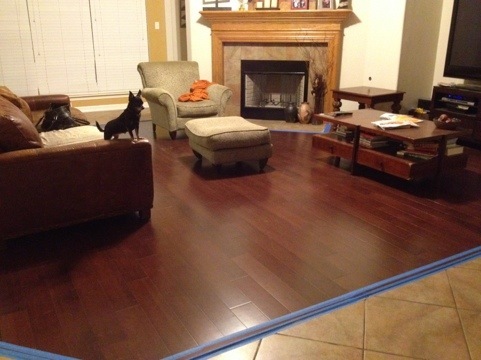 If you need someone to come do your floors, I recommend Scott Feller at 512-801-8966. His crew was excellent! He also does roofing. Now, I’m mad that I didn’t go ahead and replace the carpet in my bedroom. I think that may be next!! Looks awesome! You’ll be so glad you did that.